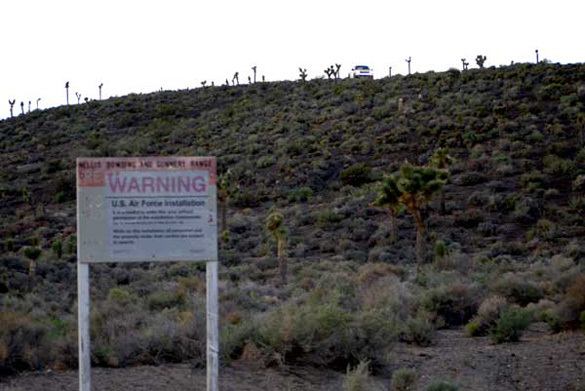 For many years people thought the existence of a secret base called Area 51 was a fairy tale told by UFO and alien conspiracy theorists. 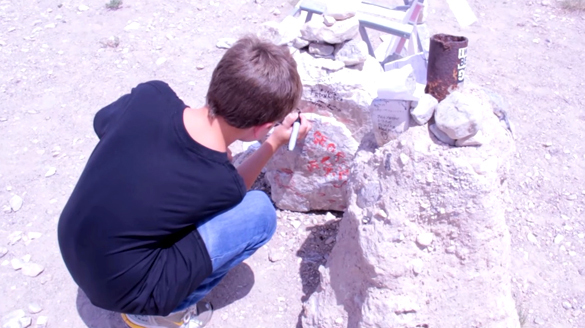 However, a family found out last summer that discovering just how real, and how secure, the base is can be as easy as driving a few yards past warning signs telling people to keep out. A stretch of Nevada highway 375 near Area 51 was renamed the “Extraterrestrial Highway” due to rumors of alien spacecraft being tested at the secretive airstrip, where the government now admits is the home to top secret aircraft development. For years the base was unacknowledged until its existence was declassified in CIA document in 2013. Along the Extraterrestrial Highway are a couple of roads that lead to gates into the base. However, once you get about 20 miles from the base, there are signs warning visitors from proceeding any further. On the hills behind these signs, security guards in trucks watch closely. In the video, Hasvold and his son stop at a location formerly known as the black box. It is where a post office box used to stand at the turnoff to the main gate to Area 51. As Hasvold mentions in the video, the box has been removed. However, tourists still stop there. While Hasvold and his son are visiting this spot, they meet some tourist who do not appear to speak English well. The family is intending to go to the Area 51 gate, so Hasvold and his son follow them. While Hasvold stops at the signs warning people to go no further, the other group decides to continue. Hasvold video tapes what happens next. The family that kept going is stopped by a truck only seconds after passing the signs. 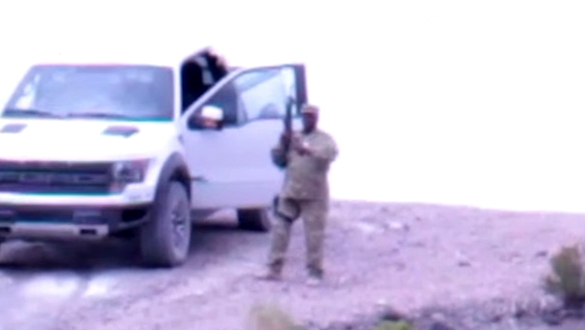 two guards come out of the truck, one apparently holding a camera, the other a gun. 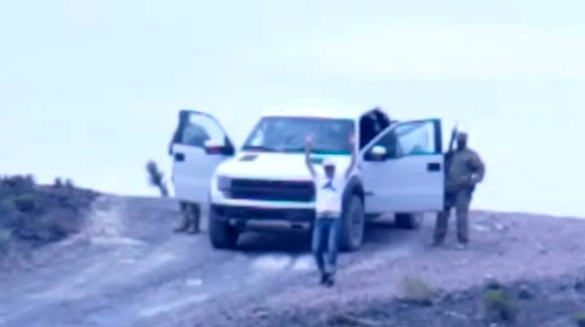 They appear to instruct the passengers of the vehicles to exit the car with their hands raised. The driver is then asked to approach the guards with his hands raised, walking backwards towards the guards. The video ends there and Hasvold does not provide any more information as to who the tourists were or what happened to them. In the past, visitors to the gate who have passed the signs have been fined and/or arrested. In 2014, a tour van accidentally crossed the line and faced steep fines and misdemeanor convictions. 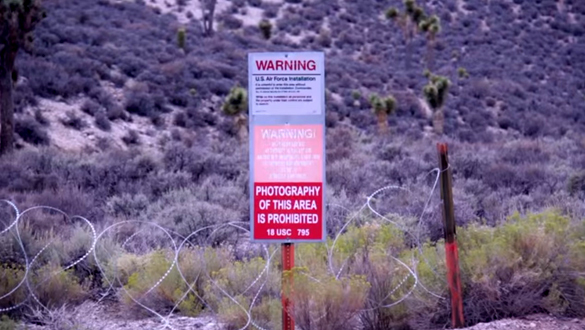 Trips to the gates of Area 51 are fun, and a Mecca for UFO enthusiasts, but if you do make the trip, for goodness sakes, do not pass the signs. No sympathy for the idiot who put his family at risk for what? Fun? A dare? Just to see what happens? Hope he gets the book thrown at him. This was a messy video. I did, kinda, appreciate the music. The glitches or pauses are deliberate and/or your video equipment must have suffered a fall from atop a 30-story building during a tornado. But, I suppose you don’t give a s—t and just wanted to get this on the internet. Boy, some kids will never grow up. As a former member of the USAF missile security system, I can assure you that random visitors are not welcome in “restricted areas”. People need to realize that security people take their jobs very seriously. Please remember this when going past warning signs! This is exactly what I thought would happen. What were the security guys supposed to do, just laugh it off and tell the guy good one? Pose for pictures with the family? I do some contracting work with a military base and I can tell you they treat security very seriously. This dad should win idiot of the year award. This issue of the biggest cosmic Watergate it is not for joke, people can lost her life’s, the ET are here at long time, they are a reality and if that was not true, they never take so much trouble to avoid this matter.